ClubCoins Needed: 54 Please note that this item is not available on your device. You may add the item to your Wish list and redeem from a compatible device. David Tennant ('Doctor Who') and Liz Carling ('Casualty') star in the sitcom about a young couple, Daniel and Lucy, and their circle of friends. 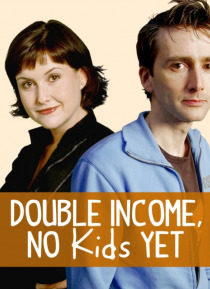 In the first series of 'Double Income, No Kids Yet', Lucy sets up Daniel's party, but their mates seem too busy with kids. Then, when a top author gets writer's block, Lucy and Daniel get landed with an unwelcome guest. In the third episode, Daniel and … Lucy's plans for a quiet weekend are hit by a stream of unplanned visitors and are later hit by other people's baby blues. Is poker really the answer? Lucy's up for promotion, but Katie can't decide on naming her baby. And in the last episode, when they're asked to be godparents, Lucy's thrilled. The same can't be said for Dan, however. This series was first broadcast in 2001.